Menambah darah, kuat badan, tahan lama (Increase blood, strengthen body, last longer) – this was the tagline for one of the earliest print ads for Obat Kuat (literally, strength medicine) and it continues to be the promise to this day. Krack! 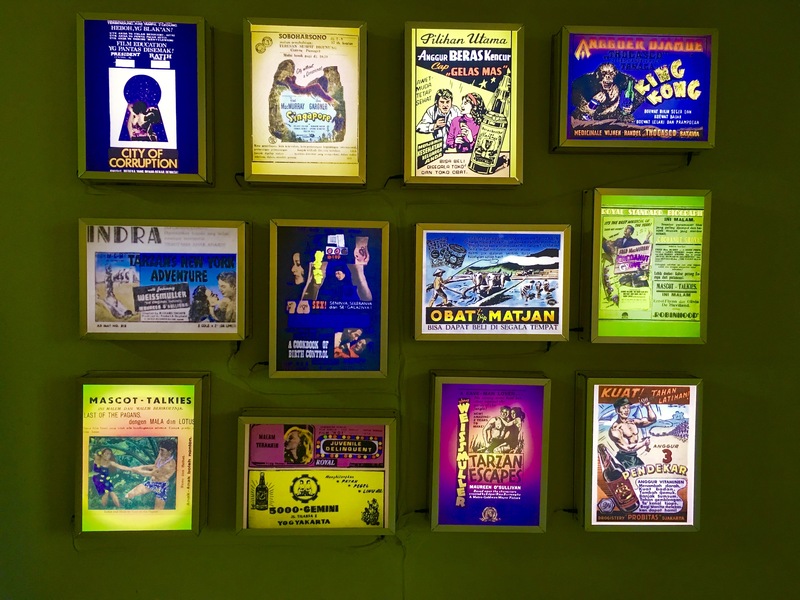 Studio’s recent exhibition of works from its Obat Kuat project focused on advertisements for a medicine called obat kuat that has been advertised and sold in Indonesia, in various compositions and applications, since the early 20th century. Examples of obat kuat would include the Javanese traditional medicine, jamu, as well as medicines imported from overseas – Viagra being a contemporary example. 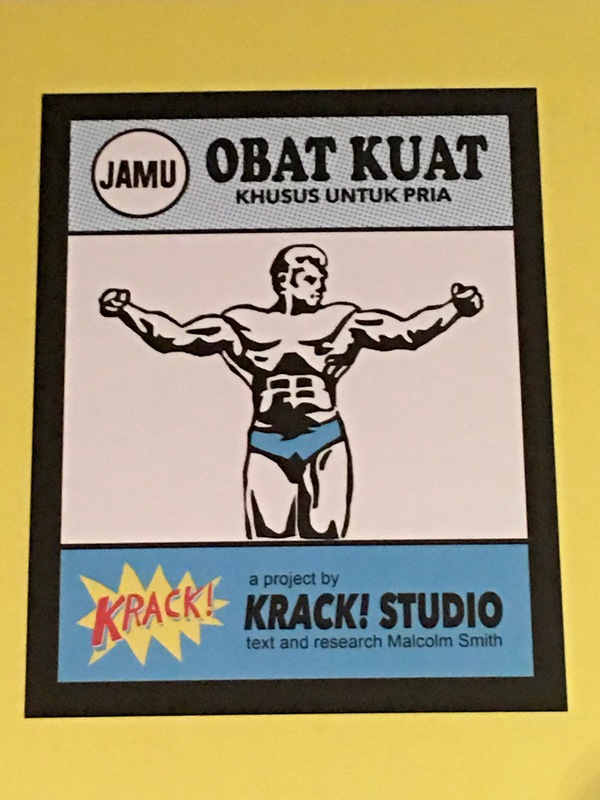 The motivation behind the Obat Kuat project was to examine the history of print advertising of the popular medicine, a product aimed at male consumers, and to explore how these advertisements reflect the social and political changes in Yogyakarta and the evolving constructions of masculinity in the city over the years. 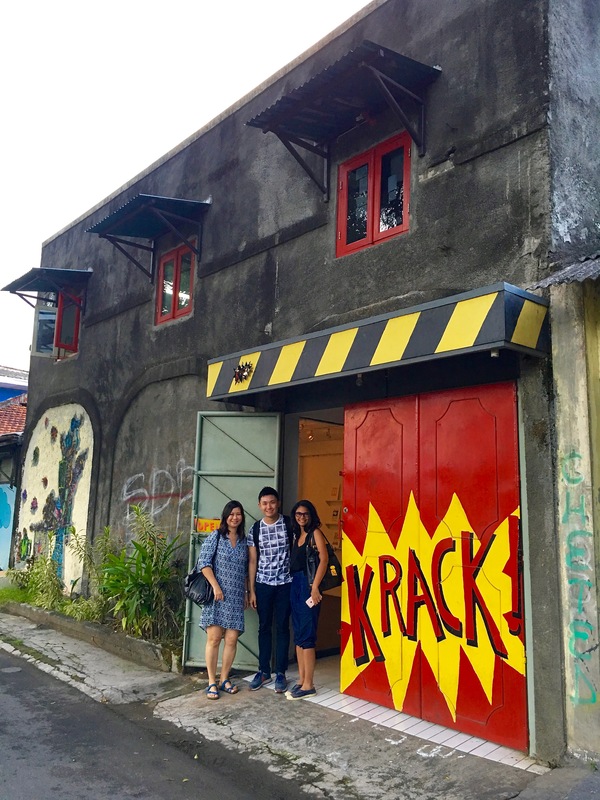 Finding ourselves with some time to spare before a dinner appointment in Yogyakarta, we thought we would pop into Krack! Studio for a quick visit. Tucked away in one of Yogya’s tiny side streets, even our local driver was somewhat hard-pressed to locate it but, thanks to Google Maps, we eventually managed to find our way there. 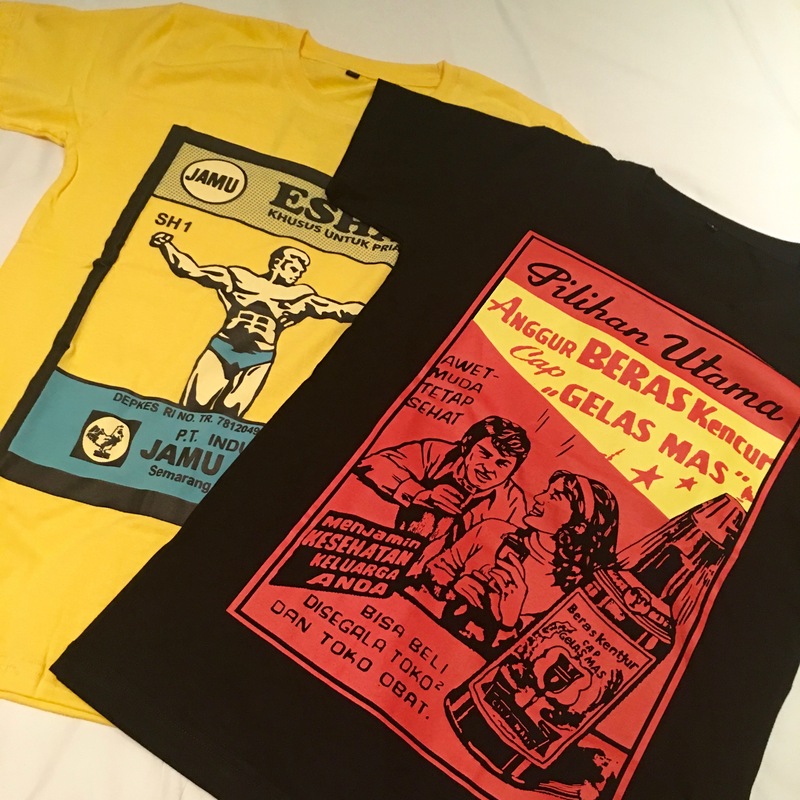 We loved the way the works looked visually, with their retro, pop art vibe, but were also fascinated by the insights they provided on what it means to be “A Man” in the context of Yogyakarta and Indonesia, from the early twentieth-century to the present. Malcolm Smith, in his catalogue essay, traces how the ideals of masculinity evolved from Dutch colonial times, through the period of the nationalist movement, the New Order, to the present day. This was one of several groups of works based on particular themes, in this case, King Kong, Tarzan and other similar movies that played in the 1930s and inspired a range of advertisements for Obat Kuat, appealing to the Indonesian male’s view of himself as an untameable “primitive” man, superficially tamed into Western ways but able, when necessary, to unleash the beast inside! We had the pleasure of meeting Moki at the Studio when we were there (thanks, Moki, for showing us around) and we couldn’t resist some of the cool merchandise that they had for sale as well – check out these T-shirts! We’re looking forward to seeing what the guys (and gal) at Krack! get up to next. If you’re ever in the vicinity, do check them out. They are well worth a visit. Krack! 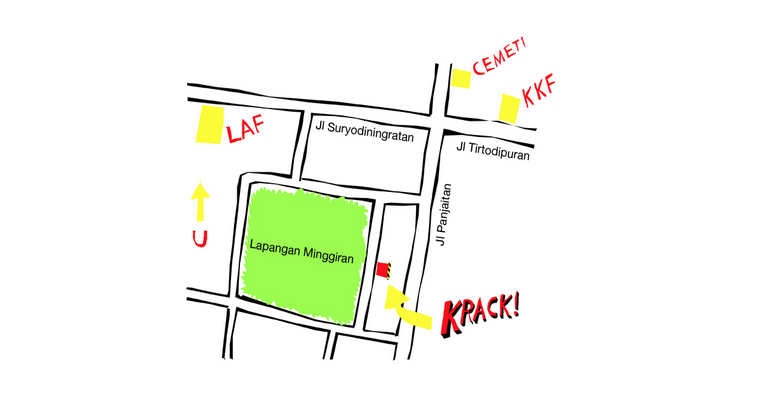 Studio and gallery is at Jl. D.I. Pandjaitan, RT: 42 / RW: 12, 55141 Mantrijeron, Minggiran, Yogyakarta (timur lapangan Minggiran), Indonesia.